David Macdonald, WildCRU’s Director explains the journey from Cecil to centipedes, and the principles that unite WildCRU’s wider working: Those of you who have been following these newsflashes, and especially if you have delved deeper into our website, will have realised that the WildCRU’s approach to conserving lions, and indeed everything else, is highly interdisciplinary (biology is necessary, but not sufficient – we need economics, human development, agriculture, regulations, and we need to span down-to-earth work on the ground, and the intricacies of international affairs) and based on technically complicated scientific issues and principles. For example, in the case of Cecil, you have already understood the need to understand the intricacies of lion social behaviour, the factors affecting their dispersal between protected areas and how the lions impact the livelihoods of local people (a topic often leading to conflict that can threaten not only livelihoods but also lives). My point today is that exactly the same type of work, guided by exactly the same principles, applies across vastly different species, and in far flung corners of the globe – and so, when I tell you the same principles span our work from Cecil to centipedes, it is not as strange as you might at first have thought. To see just how we can apply lessons learned from one species or place to other species and places, consider what was, before the explosion of interest in Cecil’s death, expected to be WildCRU’s main excitement last week: the publication of two books summarising thirty years of WildCRU’s work on farming and wildlife. Together with Dr Ruth Feber, a long-standing member of the WildCRU team and farmland conservation biologist of great international standing, I have edited these books, which reveal how issues span different contexts. For example, we show in Volume 1 of Wildlife Conservation on Farmland how working out how to conserve moths and butterflies on farmland necessitates understanding their use of habitat corridors, just as the conservation of lions in Hwange necessitates understanding their use of corridors into Botswana and Zambia. Similarly, in parts of Africa, conservationists are considering rewilding –taking less productive land out of agriculture and using it to recreate natural areas which, through tourism, may generate better livelihoods for people. Exactly the same conversations are underway about farmland in Europe. Most strikingly, of the two books Ruth and I published last week, the second is devoted to conflict between people and wildlife (and how to resolve it). This is exactly the topic of the work that Andy Loveridge and I lead around Hwange, as many of you have read in previous newsflashes. So, for example, if you have followed the debate about the impacts of hunting lions, and the societal choices associated with that issue, you will see that the parallels are close to those regarding foxhunting in the UK (where it is now illegal), on which I spent twenty years at the very heart of the storm. 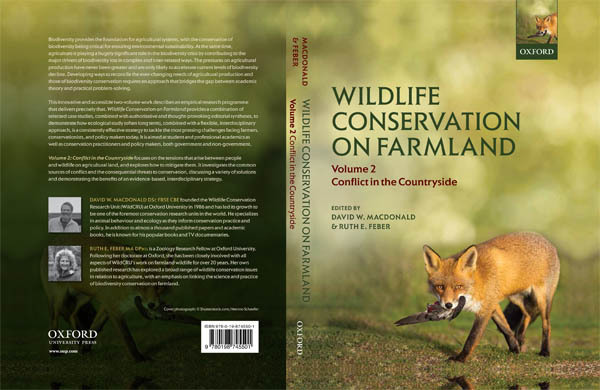 The biology, history and politics of foxhunting are described in Volume 2 of Wildlife Conservation on Farmland, as are lots of other examples of human-wildlife conflict, ranging from the problems caused by introduced species, of climate change and of wildlife diseases, such as bovine tuberculosis in badgers, together with the interface of animal welfare and conservation. My point here, however, is to convince those of you who are new to the complexities of conservation that it is a deeply interesting and far-reaching subject, and also to introduce you to the fact that WildCRU’s work is very diverse, and that the principles and problems that unite Cecil and centipedes are mind-openingly interesting. 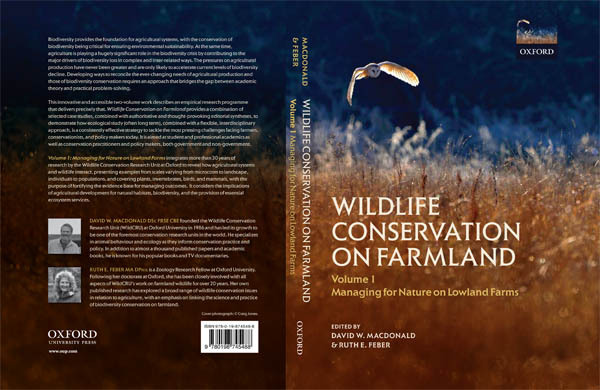 Hardcover copies of Wildlife Conservation on Farmland by David Macdonald and Ruth Feber (Editors) are available now on http://www.amazon.co.uk/ or available for pre-order onwww.amazon.com (release date 16th September 2015). Kindle Edition is available now. Discounted copies of the books are available to purchase for a limited time from Oxford University Press at www.oup.com/uk, adding promotion code AAFLY7 to your shopping basket. For further details on this promotion see Wildlife Conservation on Farmland two-volume book set.